THE WRITING BUDDHA - Opinions | Books | Movies: 03:02 by Mainak Dhar (Book Review 4*/5) !!! 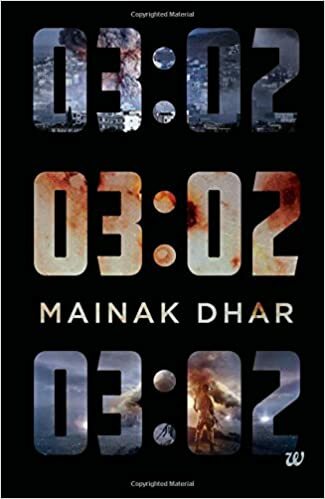 When I received this book titled "03:02" written by Mainak Dhar and published by Westland Publishers, I was surprised what it would be actually about. And then I read the synopsis and couldn't understand what the book is seriously about except that at 03:02 AM, the city of Mumbai suddenly went black with no electricity, no phones, no internet and no working cars just as if civilization was taken away from the human beings. But what is the reason for the same and how the city will overcome against it was a big question mark for me. As I began reading, I was impressed with the way the story begins and author directly comes on the topic and the city gets dark in the first few pages itself. The book becomes very slow after that as without giving us the reason of this unexpected and unbelievable circumstance, author just keeps on talking about how everything have just stopped all of a sudden. At this point, I had decided that the book is not getting anything above 2.5 stars from me but finally the reason is told to us. Though very less understandable to us and eventually we get to know that a big terrorist group has invaded the city with all its forces. And then there is our protagonist who is helping the people in his residential complex and around it just like Akshay Kumar does in the movie "Airlift". And when he comes to know about the terrorist group and how he will have to fight it with leadership, courage and conviction, he just stays positive throughout and starts managing things with the little resources and manpower that he has. The writing style of the author is very superb considering the command over the language and the narration style. Even the plot is so fresh and research-oriented, author haven't complicated the narration by streaming the timeline up and down like many other authors and confusing the reader. Even the vocabulary is simple which helps you to keep reading this book in a good speed with a flow. He has written things so brilliantly that you feel that everything is real and you even imagine it happening around you. It becomes scary after a while and I had to go for short walks outside to come out of that state of scary situation. The characterization is also nicely developed which makes you understand the background and mindset of each and every character involved. Talking about the drawbacks of the book, the first 70-100 pages aren't much interesting as author gets stuck in that one situation itself to build the premises. It could have been easily cut short down. I also feel that the book needed a lot of editing as the whole story could have been summed with the same effect in 50-60 less pages. Well, the climax is nicely written and the way book ends leave you with a wide smile than teary eyes as I expected it to end. I give this book 4 stars out of 5. I would have given it 4.5 easily if it would have been slow in terms of taking the story further. I would like to read more from Mainak Dhar in future.